We have a house guest. Andy is my mother's dog and he's been staying with us since she was rushed to the hospital on March 14. While we've been enriching the oil companies by traveling the interstate back and forth between our farm and the hospital, as well as our farm and my mother's home, the dogs have been ... well, waiting. Waiting and hoping life will return to normal. Soon. I can relate. I just wish I had the patience of a dog. The time to nap would be welcome, too. The dogs are doing a whole lot of napping and very little flying disc or Jolly Ball exercise. They, of course, know something strange has happened and they offer comfort whenever they can. Comic relief, too. They also know there's a very strange critter in their house. Andy. 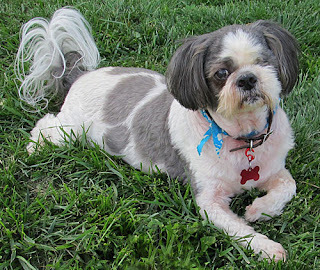 My mother's dog, Andy, is a 12 year old Lhasa Apso. At least, that's what his registration papers say. He sure looks like a Shih Tzu to me. Believed to be a Missouri puppy mill survivor, he has a long list of health problems. Not only does he have megaesophagus, Andy has lost one eye and is almost blind in the other. In addition, he has some locomotion difficulties that are most likely neurological. Andy is a money pit and the apple of my mother's eye. Normally this king of my mother's castle spends his days in my mother's lap, takes walks on a leash, and spends his nights in a very cushy bed. These days he's spending his life in our mudroom with a crate at night. And he's having some big adventures. These adventures will be detailed later this week by the dog daddy at our house. Among them are his encounters with "the big dogs" at our house, getting lost in the yard, and discovering there's a world off-leash. In the meantime, Andy is safe behind the baby gate. Safe because he has "small man's complex." No shirker, he's ready to attack and defend.. against the very curious canines on the other side of that baby gate. Ready for his next adventure which is sure to bring smiles to our faces. My Mom has one like that. However, because he's not fixed he can't come to our house. One I only had one male he attacked all the time. Now that I have Katy, my brothers have to keep her dog when she needs someone.